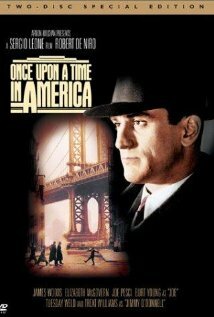 The Third Man was released in 1949 and has been an inspiration to many film directors over the years.An example of this is the legendry gangster thriller Once Upon a Time in America.The costume choice is almost identicle whith the use of long dark jackets and Trilby hats . Since then this choice of costume has become iconic and seen as a generic thriller convention. 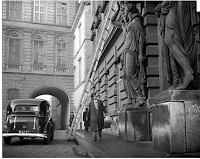 This image from The Third Man works beautifully at portraying the Austrian capital of Vienna after the horrors of world war two.It represnt Vienna as still broken and corrupt. The cracks in the ice reprents this effectively.The sunken ship represents the city as sinking and in depression and adds to the bleakness of the scene.There is also a floating human corpse which adds to the corruption of the city and is also utilised as an added clue to what may happen in the film. This shot also represents Vienna as a corrupt city.It's showing the underground illegal act of the black market. This is the introduction shot of the films key character Harry Lime.The shot has been cleverly crafted to show a darker and lighter side to his face.This represents a corrupted mysterious character who may have two sides to his personallity.The shot also makes him look very dominant with use of lighting. This is stunning well crafted shot with so much background information and portrayal of future events that occur.Holly Martin is about to walk under a ladder which is considered as bad luck.This simple idea is so effective and has a significant influence on the audience who can instantly recognise that Holly will be in trouble later on in the film.Holly is to busy looking up at the apartments that doesn't even realise he is walking under a ladder.This portrays a sense of niavity and lack of attention that could lead to his future troubles. I promised I'd take a look at your blog tonight to see how you've progressed in the last fortnight. I'm pleased with your efforts: you've put a lot of work into your research into other thrillers and have begun to make some progress with your planning. There is still a long way to go until you're fully up to date, and for this reason I think it would be a good idea if you continued to use lunchtimes this week (until haflterm) to focus on catching up with the blog work. If we spend this week on this, I am confident you can catch up. A concise and articulate analysis but you need to develop your incisive points. More food on the plate please Jonathan.